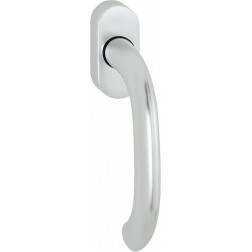 Tilt and turn window handle Hoppe aluminium Marseille series on oval rose. Anodized aluminum window handle produced by Hoppe. Particularly curved handle inward. The price displayed is for one handle boxed in its original packaging. Lastly with Secustik technology this window handle protects your windows from external break-ins.